Nha Trang is one of most Vietnam popular destinations which is a seaside resort town located along the second most beautiful bays in the country. It features beautiful beaches with fine and clean sand and clear ocean water with mild temperatures. The city has about 300,000 inhabitants and is more lively and urban in character than other beach destinations like Mui Ne and Phu Quoc. It is also the scuba diving center of Vietnam. Nha Trang own miles and miles of empty beaches, deserted bays, various island and coral reefs, providing chance to swim, snorkel and scuba dive. To take all these activities, you should attend to the tour “visiting four islands”. Firstly, you will have a chance to visit the biggest aquarium in Vietnam on the first island. The aquarium is a living place of hundred unique and special fishes and snails. You may see big shark and great grouper or the tiny fish like flying fish. Next, they will take you to one beautiful beach to swim or do activities like snorkel and scuba dive. The clean water will surprise you due to you can see through the water and see the movement of fish as well as ecology. After swimming, it is time of visiting the third island. You can choose go to the restaurant on the island to enjoy the fantastic seafood there or stay on the boat to eat the meal which are provided by the tourist guiders. After the meal, the tourist guiders will provide you one interesting activity. They will randomly pick one guest no matter they are from, they could be American, English or Japanese. The chosen one will stay on the middle of the boat and sing their traditional song. The activity is very fun and then you will have a chance to swim again. However, they provide free cocktail, wine and music for you at this time. At the last island, if you still have energy (my energy was run out), you would go through to see the wildly habit of animals there like sparrow. The tour is really wonderful; you should attend it whenever come to NhaTrang. In addition, the city becomes one of Vietnam popular destinations due to the tourists just come there for their day relaxing on the beach, getting around on walking or cycling. 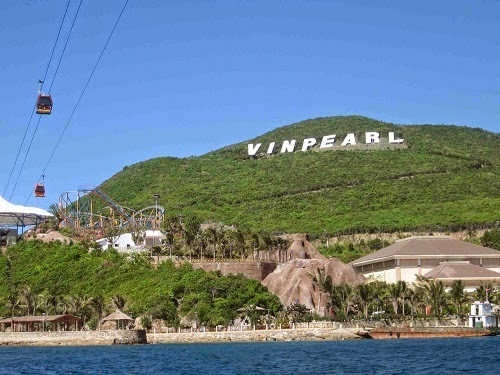 Beside, Nha Trang has many resort which are extremely beautiful and luxury such as Vinperland resort. The Miss World event in 2009 and many MissVietnam events were celebrated there. For a long time, Thac Ba hot spring center is one main element contributing to the tittle Vietnam popular destinations of Nha Trang. This hot spring center serves a special mud which is a special way to help the skin and health of tourists. There are many young girls, woman and elders visiting there every day. They bath in the mud and then bath in the mineral swimming pool. Nha Trang is also famous about the food. You should enjoy the local food like Banh Canh Cha Ca, Mi Quang or Bun Bo Hue there. The flavor is so delightful. This bay is recognized as one of 29 most beautiful bays in the world. So you have no reason to not come there, one of the top Vietnam popular destinations. So, are you ready to go to Nha Trang City? Hope you will have an amazing trip in my beautiful country. Good Luck.